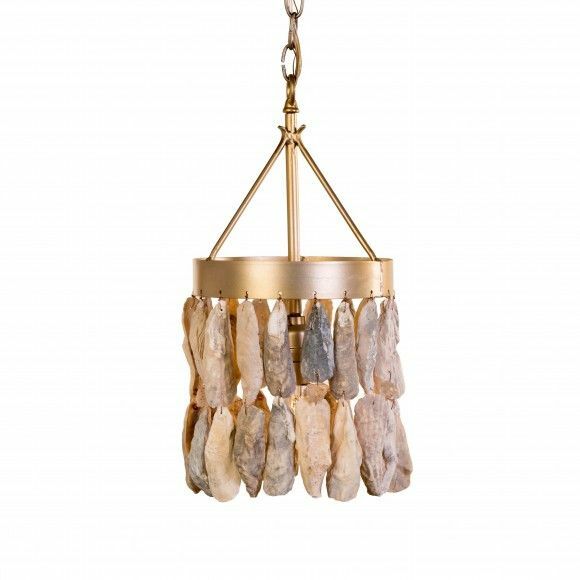 Wassau Shell Drum Mini Pendant Light is handcrafted with oyster shells gathered off the coast of Georgia. The Pendant is also available in quartz crystal nuggets. Look great in a pair over the kitchen island. Shown in a gold finish. The talent of Lowcountry artists has been nurtured to create what has become a unique line of artisanal lighting. Using natural materials like marsh reeds, old metals, driftwood and an unusual indigenous type of translucent oyster shell, they have crafted a collection of lighting capturing the essence and spirit of the region.